Cyclopath is [...] a geographic wiki, which any user can edit. On a block-by-block basis, you can add, change or correct the roads, paths, bike lanes and even alleys and sidewalks over the seven-county area and rate them for bikeability. You can add recommendations, warnings, comments and critiques. And you can add important landmarks, such as locations of ice cream vendors, bars, pizza joints, coffee shops, repair stores, drinking fountains and portable toilets, all from a bicyclist's point of view. 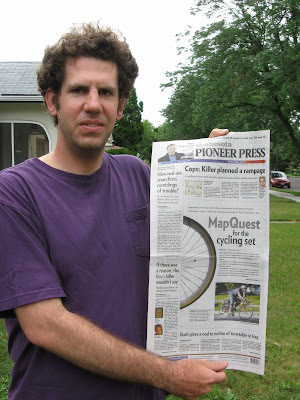 I like the Pi Press article slightly better because it describes Cyclopath's features more effectively, and also because it's the lead item, with a photo, on the Pi Press home page. As a result of the publicity, I'm receiving requests to be a tester and/or to be notified when Cyclopath goes live every few minutes. 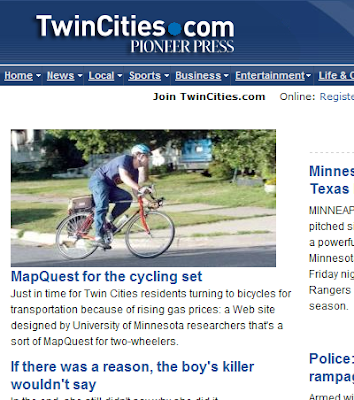 Cyclopath is on the Most E-Mailed list on the Star Tribune front page. 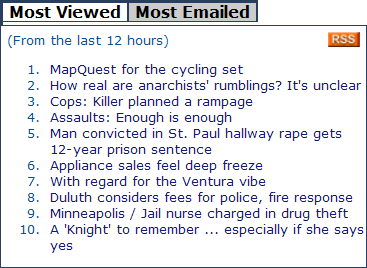 Cyclopath is #4 on the Most Viewed list on the Pioneer Press front page. Turns out the Pi Press article was on the front page! How many houses does John McCain own?